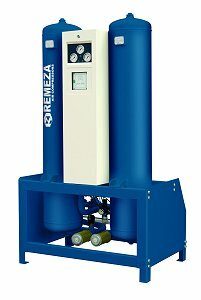 For optimum performance, Remeza pre and after filters should be used. * Please use the correction factors on the back if conditions are different from standard. Refer to the graph on the other side of this page. Model Capacity Dimensions Weight Connection Power cons. The capacity of the dryer is based on the intake volume of the compressor at 20°C, 1 bar (a). Deviations from these operating conditions might affect the performance of the dryer. To calculate the capacity under the "worst case" operating conditions (lowest inlet pressure, highest inlet temperature, lowest required pressure dewpoint) please use the correction graph. Following the red arrows from 45'C to -20'C then down to the 4 barg line, we find a correction factor of 0.78. The dryer capacity will be reduced to 78% of the maximum dryer capacity. The blue arrows show a correction factor 1 for standard operating conditions.